The Bhakthavatsalam Educational Trust was started in the year 1958 to commemorate the 60th birthday of Late Sri.M.Bhathavatsalam, the former Chief Minister of Tamilnadu. There are many educational institution started under the Trust. The Sarojini Varadappan Girls Higher Secondary School is one amongst them. Thiru.A.Vamanan is present President of the Trust. Padmabhushan Dr. Smt.Sarojini Varadappan is the Founder Correspondent of our school. 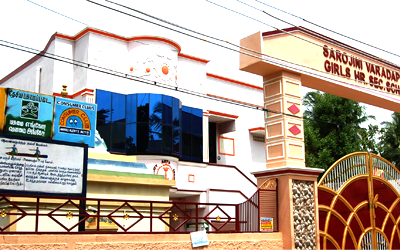 It was started in the year 1960 to cater to the educational needs of the rural girls in and around Poonamallee. It is the only institution imparting quality education to the girls. Born in September 1921, Dr.Smt.Sarojini Varadappan is the daughter of Sri.M.Bakthavatsalam former Chief Minister of Tamil Nadu. Her education was discontinued after 9th std due to the conservativeness of her family. But she resumed her studies after marriage and completed her Master's in Political Science & in Vaishnavism. She got her Ph.D at the age of 80. She was involved in social activities ever since her early days. She served as the President of Women's India Association. She has been a member of the Indian Red Cross Society for over 35 years. She has been honoured by the Government of India with Padmasri & Padmabhushan. Realising the importance of education for rural girl children, The Sarojini Varadappan Girls Higher Secondary School was started in 1960 with the strength of 200 girl children and 5 teachers. Now the school has grown to a strength of 3100 children and 47 teachers with ISO 9001:2008 certification, offering eight groups in general stream and three groups in vocational stream.